Seems like five minutes ago, but it was another era. Before the three-point line, before the shot-clock, and long before the best players in the game skipped to the pros after one season (and for a time, ala Lebron James, skipped college all-together), here was this team that won game after game, overcoming ridiculous odds in one bizarre event after another. Sure, a few years before it was Bird vs. Magic, but that attained its legendary status when both men and their teams revived the NBA during its most enduring mano-a-mano rivalry. And, of course, it wasn’t as if there had never been upsets in college basketball, but the ’83 Wolfpack was one for the ages. There has quite simply never been nor has there ever been since a college team so completely overmatched, so irrevocably poised, so damned exciting as N.C. State winning game after game in such a concentrated period of time. Instead of one enduring upset in a 40 or 60 minute contest; Villanova’s incredible upending of the mighty Georgetown in the 1985 NCAA Finals or say the N.Y. Giants improbable defeat of the undefeated New England Patriots in Super Bowl XLII, consider one solid month of upsets – nine in a row. To put into perspective, only three other upsets in American sport trump what the Wolfpack achieved in 1983; the 1980 USA Hockey team, The 1968 N.Y. Jets and Buster Douglas taking down Mike Tyson. You know, the type of Hollywood-esque fluff that transforms a century’s worth of sports clichés (destiny, momentum and clutch) into pure magic. 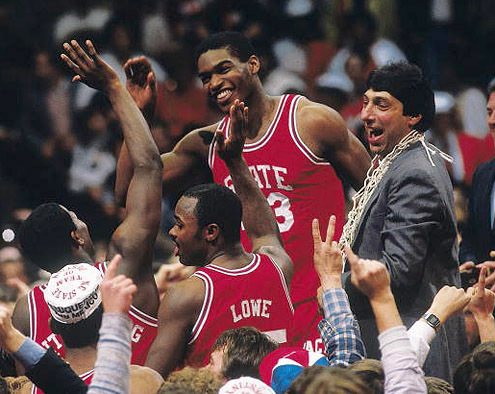 The grand wizard of this run, State’s coach, an Italian motor-mouth from New York City named Jim Valvano, showed up on Tobacco Road three years earlier and began having his kids practice cutting the gym nets down in mock victory ceremonies every week. The players thought him mad. It was silly. Who does this? However, slowly but surely, Valvano was teaching his team more than basketball. He was teaching them to dream; to visualize hope and expect the impossible. He was corny. He was goofy. He was the perfect lunatic for a collection of kids who bought into the Disney tripe that takes a pedestrian 17-10 record (the second most losses to win an NCAA title) and sweeps it through an ACC Tournament loaded with talent, wins and trophies. Slowly but surely, Valvano was teaching his team more than basketball. He was teaching them to dream; to visualize hope and expect the impossible. Due to its poor record, a symptom of injuries and inner turmoil, all N.C. State had to do was win the damn thing just to qualify for the Big Dance. Along the way, this meant besting defending champion North Carolina with three starters destined for the pros, including arguably the greatest player in the game’s history, Michael Jordan, and a Virginia team with the best player in the conference, the 7’4″ monster, Ralph Samson. Both teams, along with Wake Forest, whom State beat to earn a shot at these titans, had dismantled them during the regular season. And in each game the opponent had a lead late or in overtime, and yet could not halt the hoping and dreaming. During the North Carolina game, Valvano was faced with a six-point deficit (no three-point line or shot-clock) against Dean Smith’s heralded and roundly mocked four-corner offense, in which the team passed the ball around half court for up to five minutes to kill the clock and end the game. So he decided to begin fouling. And as State fouled, North Carolina kept missing subsequent foul shots. State won. This tactic would readily assist the dreamers during their spectacular NCAA Tournament run to come. Leading up the championship game against the heavily favored Houston Cougars, the nation’s baddest squad, nicknamed Phi Slama Jama due to the parade of high-flying dunks the 31-2 team rained down on its shell-shocked opponents, Valvano continued the “foul” strategy. To put pressure on opponents, State even fouled a player during a tied game late in one of the semi-final rounds. Then Valvano started putting Houston on the foul line and Houston began missing. N.C. State, having won the craziest, most gut-wrenching contests just to get this point, would drag the Mighty Phi Slama Jama into its web of dreams. Miraculously, the team’s poise and Valvano’s scheming took the entire run, the entire season, down to the final seconds tied at 52-52. Once again State held back and let Houston pass the ball around the perimeter until it came to Alvin Franklin, a freshman guard with the least experience of the invincible Cougars. Then Valvano, running like a banshee up the sideline, screamed for someone to foul him. Years later, when my family had moved to North Carolina in the mid-eighties and my brother went to N.C. State (like Valvano, by way of Iona) and my dad became a season ticket holder, whenever I would visit we could not help but remember watching this moment unfold back in New Jersey. How we coached right along with the crazy Italian, who asked a fair basketball team to be great again and again, and for good measure, one more time. And everyone who knows basketball history, that knows about this March Madness business, and how it got started, with a riveted nation and the kids against the men and the impossible becoming reality, knows what happened: Shooting guard, Dereck Whittenburg heaved a prayer with five seconds left from nearly half quart and center Lorenzo Charles sidestepped the mighty Olajuwon, whose nickname was poetically, The Dream, caught the thing in mid air and dunked it home at the buzzer.